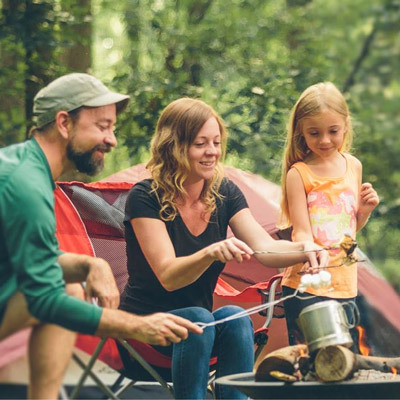 Whether you are looking to visit Roanoke for the first time or you just need a weekend getaway, there are plenty of campgrounds and camping areas to choose from. From the Alleghany Highlands to Franklin County and Smith Mountain Lake explore your options. Many of these camping options, especially those in state parks, have limited availability and require reservations. Others may have primitive amenities. Make sure to check all pertinent information and bring everything you need to make the most of your outdoor adventure. Alta Mons campground is open from April 1 to October 31. There are 37 RV sites with water & electric (dump station too) and 7 tent sites. Each site (tent and RV) comes with a picnic table & a fire pit. There is also a bathhouse with flush toilets and showers available. RV sites are $25/night and tent sites are $15/night. Arcadia Campground is located just 2 miles off Interstate 81 (Exit 168) at Arcadia. This primitive campground has been designed for tent camping for paddle in or drive in customers. Each of the eight large campsites are numbered and include a fire ring, picnic table, parking area, and level tent area. Portable toilets and a dumpster are available. Due to its wilderness style and low impact design, no RVs, trailers or generators are allowed. Blowing Springs Campground is located just off of Virginia Highway 39. This area offers a variety of camping situations. The lower portion of the campground is a mostly open grassy field with plenty of room to spread out. The upper area is small tent sites in a wooded setting. The campground has vault toilets and a hand pump for water. There is also a dump station for recreational vehicles. Camping is $12 per night and sites are open March 15 through September 13. Blue Ridge Campground is located on Smith Mountain Lake and has spots for travel trailers, RVs, and pop-ups. Campsites have lake access and the campground is open April 1-Oct. 31 each season. Bolar Mountain Campground includes multiple camping options at Lake Moomaw. Campgrounds 1, 2, and 3 are open at different times during the year. Campground 1 is open late March through early December. Campground 2 and Campground 3 open early May and close after Labor Day. Most sites can be reserved by calling 877-444-6777; remaining sites are first come, first served. $16 per night for sites with no electricity; $20 per night for sites with electricity. Family and group camping areas can be reserved at McClintic Point by calling 877-444-6777. Boley Fields Group Campground is located near Poverty Creek and Pandapas Pond. It is a group campsite with a vault toilet and no other amenities. It is perfect for up to 50 people with access to miles of trails for hiking, biking, and horseback riding. Reservations are required. The Buckhorne Family Campground features 24 campsites, a dump station, a log cabin, a bunkhouse, a bathhouse, a children’s playhouse, a small stage, picnic tables, a camp store, camp kitchen, camp video store, and camp ice cream parlor. A recreation field that features horse shoe pits lies behind the camp store next to the bathhouse that has hot showers for men and women. Gravel based RV sites are fairly level and easily accessible off the gravel road that forms a horseshoe around the camp store. Each of the Buckhorne’s dirt based tent sites are shaded. Wilson Creek, a designated Virginia Trout stream, flows through the campground. Caldwell Fields Group Campground is located on Craigs Creek and near Pandapas Pond and Poverty Creek Trails in Blacksburg. It is a group site with a vault toilet and large fire pit, with no other amenities. It is perfect for large or small gatherings with great access to miles of trails for hiking, biking, and horse back riding. No reservations needed at Addison Field; Milton and George Fields are available by reservation only. Camp Bethel is located just 6 miles from the James River, 3 miles below the Appalachian Trail, and right on the TransAmerica Bicycle Trail. Camp Bethel is open year round for tent camping. Seasonal bathhouses are open April through October. 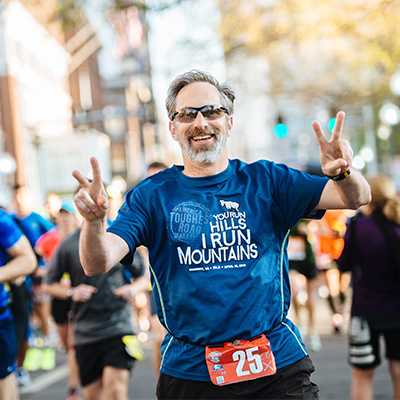 Cave Mountain Lake, nestled in the Blue Ridge Mountains of Virginia, welcomes generations of families who enjoy the rustic beauty and peacefulness of the area. Daytime visitors and campers favor swimming, picnicking, sunning, and fishing at Cave Mountain Lake. The Civilian Conservation Corps built the 7-acre, man-made lake in the 1930s using existing buttresses of natural rock to form a 35-foot high dam. There are 42 tent camping site and a few RV camp sites available. Craig Creek Recreation Area, located in Botetourt County, is a great place to take the family to enjoy the outdoors. Families and groups can camp, picnic, fish, wade, and hike. The recreation area encompasses over 130 acres of pasture and woodland on a peninsula formed by Craig Creek. Visitors who wish to camp must come to the district office for a permit and gate lock combination. The reservation fee is $25 per night for groups up to 50 people. Deer Island Recreation Area is located at Philpott Reservoir and is only accessible by boat. It is first-come, first-serve, no reservations. You must obtain a camping permit from the park attendant at Salthouse Branch Park. Overnight camping is available at Explore Park, including primitive sites, canvas tents, bell tents, yurts, pod cabins and RV sites. Guests have access to a bath house within the park, and close proximity to amenities including hiking and biking trails, river access, a visitor information center, an 18-hole disc golf course, equestrian services and weekly environmental education programs in coordination with the National Park Service. Explore Park is located directly adjacent to the Blue Ridge Parkway, just 10 minutes from downtown Roanoke’s shopping and dining scene. Gala Campground is located off U.S. 220, 4 miles south of Eagle Rock. The primitive style campground features many river front sites and has been designed for tent camping for paddle in or drive in customers. Each of the 12 large campsites are numbered and include a fire ring, picnic table, parking area, and level tent area. Portable toilets and a dumpster are available. Due to its wilderness style and low impact design, only small RVs or trailers are allowed; no hookups or generators. Goose Dam Campground is set in a tranquil setting on 10 acres with a catch and release fishing pond. Tent sites are situated along a stream and there are RV sites with water, sewer, and electric hookups. Amenities include a bath house, laundry, playground, fire pits, and more. Goose Point Park is nestled on the shores of Philpott Reservoir; the lake covers 2,900 acres and has 100 miles of shoreline. The area offers camping, day-use facilities, trails, beaches, and more. The primitive campground is open year round and includes showers, water front campsites, a boat ramp, fishing pier, and playground. Make reservations online. Hidden Valley campground offers 30 campsites, vault toilets, dumpsters, picnic tables, grills, and drinking water. The 6.5 miles of the Jackson River offer excellent fishing for stocked and native trout and other cold water fish species. Approximately 2 miles of the Jackson River is a special regulation area with restrictions on fishing methods and size. The 20 miles of trails offer excellent opportunities for hiking, enjoying scenic views, fishing and hunting access, and for mountain biking. Hopper Creek offers a Rustic atmosphere for tent camping for groups. It has a large mowed area for games and other activities. Hopper Creek is just a short drive to Cave Mountain Lake Recreation Area and the James River Face Wilderness, Appalachian Trail, Blue Ridge Parkway, and Natural Bridge. Hopper Creek has large grassy areas. There are three large group tent pads with wooden picnic tables and fireplaces. It can accommodate up to 50 people. The site has vault toilets and parking spaces for cars, but not trailers. Horseshoe Point Park is located on Philpott Lake in Franklin County. The park offers camping and day use facilities that includes 49 campsites, 15 campsites with water and electrical hookups, hot water shower house, restrooms, swimming beaches, a two lane boat ramp, courtesy dock, a dump station, and one group picnic shelter. Horseshoe Point Park is open May 1 through Sept. 30 and you can reserve a spot online. Middle Creek Campground in Buchanan is a family-owned and operated campground that prides itself on hospitality, unrivaled natural beauty, and a wide range of outdoor activities. The campground is nestled deep in the foothills at the edge of the Jefferson National Forest. Originally built in the 60s as a hunt camp, Middle Creek Campground offers camping, hiking, fishing, swimming, and sitting around the campfire to relax. Morris Hill Campground is nestled in the scenic Allegheny Mountains, 18 miles north of Covington on Route 605. 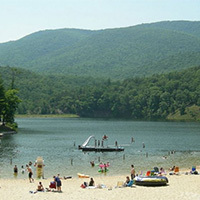 The campground is part of the Gathright Dam and Lake Moomaw Recreation Area of the George Washington National Forest. Lake Moomaw is a 2,500 acre lake with more than 40 miles of shoreline. Morris Hill has 55 campsites and three bathhouses with flush toilets and warm-water showers; 16 sites can be reserved through the NFS Recreation Reservations system at 877-444-6777. Other sites are on a first come, first serve basis. All sites are open May 1 to October 31. The area is abundant with hiking, biking, fishing, boating, and swimming options. 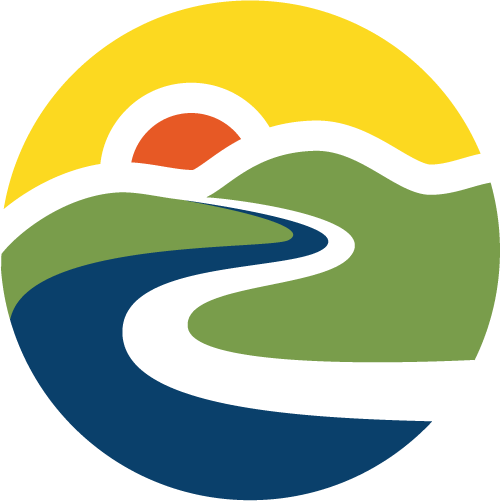 New River Trail State Park has been designated an official National Recreation Trail by the U.S. Department of the Interior. The park parallels 39 miles of the New River, which is one of the world’s oldest rivers and among a handful of rivers flowing north. Foster Falls offers primitive camping. North Creek Mountain Campground has a trout stream, which runs through the area with several creek side camping units. The nearby trails include Whitetail, Cornelius Creek and Apple Orchard Falls, and a large expanse of national forest land. Campground hosts are available for information and assistance during the summer. The campground includes 14 campsites (single) and one double unit. Each has a parking spur, tent pad, picnic table, fireplace, and lantern post. North Creek can accommodate recreation vehicles up to 22 feet, and features vault toilets, central hand pumps for water, central garbage container, and a trailer waste disposal system. Peaks of Otter Campground is located off of The Blue Ridge Parkway. It is a 144-site campground at the foot of Sharp Top Mountain, with sites for 92 tents and 52 trailers. Facilities include water, comfort stations with flush toilets and cold running water sinks, but no showers or hook-ups. Camping is only permitted in established campgrounds. RockRidge can accommodate a romantic getaway, weddings, large corporate, and family retreats. Camping is a favorite or request, as are one or two room chalets accommodations. 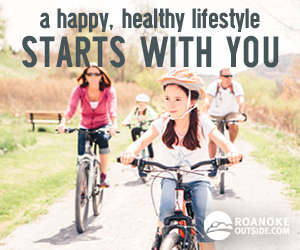 There are plenty of recreational adventures — fishing, swimming, kayaking, floating, hiking, riding, and biking — to keep you busy. Rocky Knob Campground is one of the first developed areas on the Blue Ridge Parkway and is noted for its rustic and rural landscape, plus great camping and hiking. The campground has more than 100 sites for tents or recreational vehicles, but no water or electrical hookups to individual sites. Salthouse Branch Park is located on Philpott Lake in Franklin County. The covers 2,900 acres and has 100 miles of shoreline. The park offers camping and day use facilities that includes 93 campsites, 26 campsites with water and electricity, hot water, shower house, restrooms, swimming beaches, boat ramps, a courtesy dock, one sanitary dump station, a group picnic shelter, an amphitheater, a playground, a 1/2 mile loop nature trail, and park attendant services. The camping area is open late March through late October. Make reservations online. Steel Bridge Campground has 20 units, each with gravel parking spur, wooden picnic table, fireplace, lantern post, and tent pad. Most sites are designed for tents, but recreation vehicles up to 16 feet can be accommodated. The site has a hand pump for water, central garbage containers, and toilets. Camping is free, but reservations are required. The Pines Campground has 17 camping units, each with gravel parking spur, wooden picnic table, fireplace, lantern post, and tent pad. Most sites are designed for tents, but recreation vehicles up to 16 feet can be accommodated. Other features include hand pump for water, central garbage containers, vault toilets, group camping and horse area, four camping units with space for trailers, and a horse corral and unloading ramps. Built in 2006, this campground is located on top of Flat Top Mountain. It is perfect for camping with horses; there is plenty of shade and every site has a metal pipe corral. White Cedar’s main attraction is its proximity to a 20 mile system of intersecting trails of varied lengths and levels. You can ride directly from your campsite to the Flat Top Trailhead. The camping area has 16 camping units — 13 single sites and three double sites, each with a lantern post, fire pit, tent pad, and picnic table. There are centrally located water and vault toilets, but no showers or electric hook-ups. White Rocks Campground is a great camp spot for those who enjoy a natural setting and don’t need lots of amenities. It is set in the midst of a typical Appalachian forest and a small creek meanders through several sites. Small RVs would work in most sites. Larger campers can be accommodated in the pull-through sites. There are no showers or electric hookups. Reservations are not accepted at White Rocks Campground. It is usually only busy on holiday weekends. A 1.5 mile nature trail begins and ends in the campground. This easy trail is named “The Virginias Walk” because it travels from Virginia into West Virginia and back.